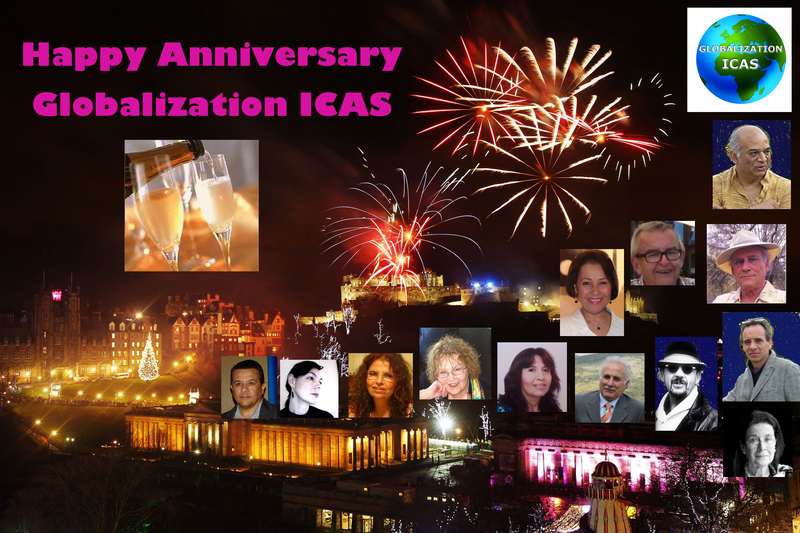 We welcome ideas to celebrate our first anniversary of Globalization ICAS special for the month of August !!! We look back to the whole year reflect on all the individuals that played an active role in shaping the organisation and what it represents for each member.., any changes that you would like to implement that will make a big impact. Chef d’entreprise, négoce d’antiquités / Antiques business, Owner. This is a great & a very joyful card Sunil ! This has been a great joy to me being with you all this year, discovering outstanding works & talents, getting to know you & making genuine friendships. Without speaking about the numerous & kind feedbacks we’ve got! All things that makes life enjoyable, nourishing & stronger even though every hour doesn’t shine bright always & for all; We had one more reason to rejoice! I believe year 2 will see new developments & achievements. Thank you all for you made my year ! Sunil you’ve made a happy, joyous 1st Year Anniversary Card. Congratulations to you, the first m embers who helped to bring to life our creative home & to everyone who has found their way here. I’ve made wonderful friendships, learned many new ideas, feel I have a great support group to help me learn & grow. I’m looking forward to being an active part of Year 2. Sunil Fantastic Video celebrating our wonder first year. I look forward to being a part of this group for many years to come. All the art direction and development including video production are one of the many talents I have been putting to good use after many years. In my early days I was a professional photographer used all types of cameras single lenses 35mm to plate cameras to video.. advertising studio ran advert campaigns for multinational clients from airline to banking this was before I established the developments of our ICAS UK now celebrating 30 yrs. It always good to be active! Bonjour Cristina, c’est toujours un plaisir d’entendre de nos membres, remercier pour se joindre à nous aujourd’hui dans notre salon créatif. Une des préoccupations que nous avons évoqué au début de notre organisation est la capacité pour tous les membres de prendre part à nos discussions, a donc confirmé de la politique pour tous les membres d’écrire dans leur propre langue, afin que vous pourriez participer plus ont vos mots traduits en anglais pour que tous les membres comprennent ce qui a été dit.., donc n’hésitez à prendre une part active dans notre salon créatif. Je vous remercie pour vos meilleurs voeux…, ont un jour heureux aujourd’hui et pour la semaine de repos!! Good morning Cristina it is always a pleasure to hear from our members, thank for joining us today in our creative lounge. One of concerns we raised in the beginning of our organisation was the ability for all members to take part in our discussions, therefore confirmed the policy for all members to write in their own language so that you could participate plus have your words translated into English so that all the members understand What was said.., therefore please feel free to take an active part in our creative lounge. Thank you for your best wishes.., have a happy day today and for rest the week!! Peter Filzmaier Sunil, This banner is a work of art as is your creation GICAS. Congratulations. Didier Dubuy Yes, my thanks were going to him as well on the same reasons you did mention. + extra belief Sunil has been truly inspired from above – or from within as you like- to have made this GICAS family blossom that way. Sunil Vilas Jayant C Mistry Thank you for your kind message and well wishes. Our organisation was founded so that every creative minds around the globe could be involved and participate including yourself never to late to start..
Mira Adam Thank you so much Sunil for sharing and Happy Anniversary. Wish you success all the way through. Mona Youssef Congratulations dear Sunil Vilas and yes, it is the time to celebrate the happy result after working so hard for one year to making it that successful. Best wishes to you and to all members and thank you for all you do and have done. Mona Youssef Sunil, it takes a good, expert and caring leader to make it so successful for all participants, and you have them all. Thank you once again for you great efforts. Love and peace. Great efforts have been exerted. Happy Anniversary. Wish you more and more fruitful achievements. To you and to all members who have made possible this wonderful site. Cheers to all and lots of love! Congratulations on the highly successful launch of your global network to promote contemporary art and sculpture, and the creative spirt. I appreciate the opportunity to be part of the start-up as a participant in the ICAS monthly theme exhibitions. It was encouraging to receive kind support from the fine panel that was assembled for theses shows. I especially appreciate the new relationships started through the ICAS. Sunil, and everyone that has contributed to this effort, I thank you! Welcome to both Lucia and Donald hope all i well with you both.., Thank you for your kind words, we all deserve a Big Hug for our accomplishment. It is also reassuring to see we all moving together in the same direction. We should archive date of the beginning of GICAS and celebrate the date each year as other cultures celebrate their new year. We can celebrate the new year’s day as the culture of Globalization International Contemporary Artists an Sculptors. Thank you Sunil and all the participants and members who contributed in our discussions, and exhibitions. I would also like to add a special thanks to the jurors of the exhibitions and to the members of the Theme Committee. I have personally gained a great deal over the last year from all the active members who participate in the discussions and exhibitions as I have read comments and emails and viewed so many original works of art and thereby expanded my perception. Some of my happiest moments during the last year with Globalization ICAS were when I shared comments with the other members! Also I was so happy with the two VIP Lounge interviews that Sunil did about me and the conversations that I had with other members after that. I love being a juror for the monthly themed exhibitions & appreciate all the levels of entry and the originality of each art work! I look forward to celebrating our creativity together in the next year!